You know when they say, "it's the thought that counts?". We're pretty sure "they" never had their Christmas gifts taken over by Halloween Town's Pumpkin King, Jack Skellington. Actually, we've all gotten a few nightmare gifts in our lives. There was that time when your aunt Bertha gave you slippers that looked like they were made from shag carpeting from someone's VW Bus. And there was the time your co-workers panicked when it came to the Secret Santa exchange and gifted you his very own coffee mug, grimy coffee stains included. But really, these are gifts from people who aren't thinking. Nothing you've ever unwrapped can beat the horror (cute horror but still awful) of this scary Teddy from the Nightmare Before Christmas. This little Teddy is ready to spread fear and cheer alike! It's easy to throw on with a jumpsuit that secures with hook and loop strips on the back. The detachable cape and the padded jumpsuit alike are patterned in a scribbling, Tim Burton-esque style. The hood secures under the chin and has a wide smile, eerie yellow eyes, and big ears for a cartoonish monster look at a glance. 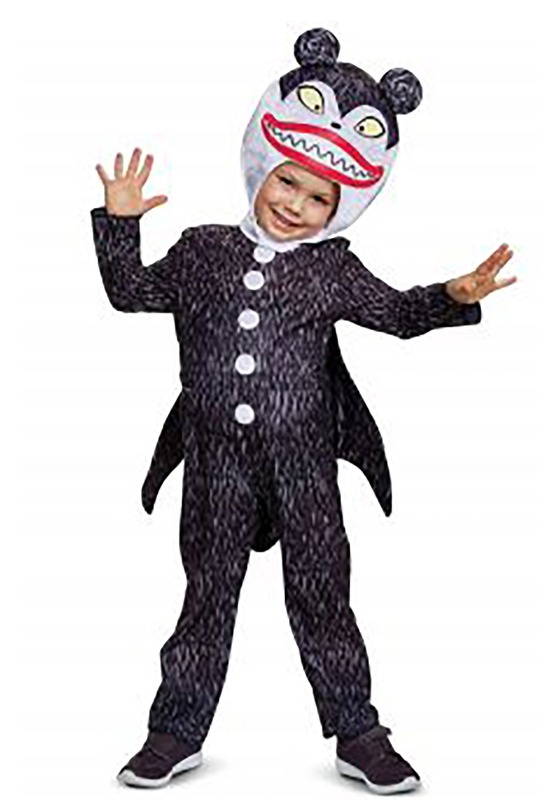 With sizes from 2T to 4/6, any kid will love spreading the fun kind of fear in Nightmare Before Christmas style. We can already see your little one sneaking around, delighting in sharing the spirit of the holiday. This little Teddy is the perfect balance of sweet and scary so you don't have to worry about your little one getting nightmares from their own reflection. The detachable teddy head allows you to take off the hood easily so transitioning from Trick-or-treating to playtime is a breeze. Make this a family look with characters like Jack Skellington, Sally, and even the Ooogie Boogieman. You can be sure no one will ever forget your adorably nightmarish look!